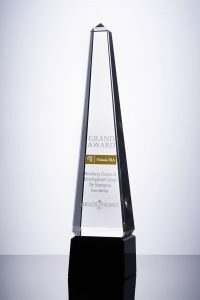 Newberry Homes was recognized with the Grand Award for Custom Homebuilder between $500,000 to $1Mil at the Parade of Homes Gala Friday evening, April 7, 2017 for their Hemingway model. Ponce Inlet Key had a tremendous showing during the Parade of Homes with hundreds of people discovering this boutique subdivision for the first time and touring the model home, The Hemingway. During the Parade of Homes, Ponce Inlet Key’s first homebuyers toured the model home and decided that they wanted that 2-Story home on the ocean lot. They signed the contract with Newberry Homes Monday afternoon, only 3 days after Newberry Homes was honored at the Parade of Homes Gala. There are now only 4 lots available to purchase in Ponce Inlet Key. Established in 2014, Newberry Homes & Development Group, Inc. (Newberry Homes) is a custom homebuilder and real estate developer serving Volusia County, Seminole County and Orange County, Florida. They specialize in real estate development opportunities like boutique subdivisions, spec homes for investors and luxury custom homes for homebuyers.